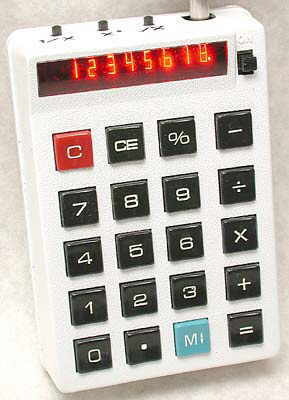 Many Summit calculators used a very similar, small but chunky case, as in these examples. Summit K16, here labelled Citaco K16. Distinctive features: One of a distinctive series of small hand-held calculators made by Summit. 4-functions, constant. The "D" key refreshes the display once it is automatically switched off after the calculator is unused for some time. 68 x 101 x 34 mm (2.7" x 4.0" x 1.4"). Summit International Corp., Salt Lake City, Utah. Manufactured by NCE Nuclear, made in U.S.A.
One of the very small and distinctively styled calculators from Summit, one of the smallest using the Texas Instruments "Klixon" keyboard common on early calculators. The calculator is quite thick and much of the space is wasted by the large battery compartment, much larger than the battery. 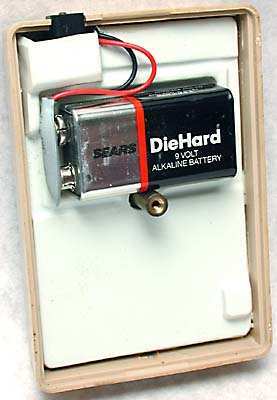 The case was actually designed for a set a rechargeable cells, as seen in the K16 below. 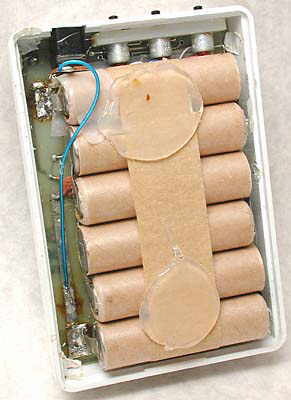 With rear cover removed, showing the six rechargeable cells. Distinctive features: One of a distinctive series of small hand-held calculators made by Summit. Rebranded with the Citaco name. "A product of Summit International Corp., Salt Lake City, Utah. The logo is actually a matrix with a 'C' filled in. On this calculator it has had to be rotated 90° anti-clockwise to fit in the small space on the left below the display. 4-functions, %, memory, with reciprocal, square, square root on separate buttons on the top. 70 mm x 103 mm x 35 mm (2.75" x 4.0" x 1.4"). The SE88M does not have enough keys on the front for all the functions, so, unusually, three extra buttons are mounted on the top. 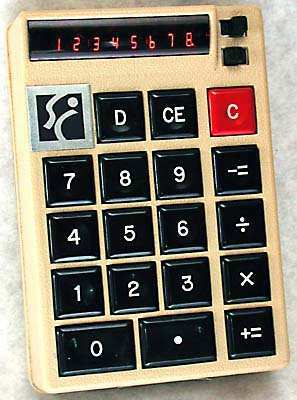 In 1971 Ed Price made a prototype hand-held electronic calculator using a carved wooden case and breadboarded electronics. Nuclear Controls and Electronics (NCE) of Salt Lake City were interested in diversifying and contracted Ed and his calculator. 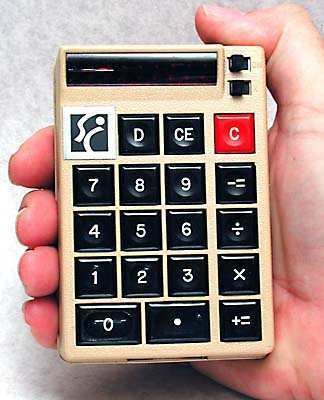 They were marketed by the affiliated Summit International Corporation and a series of generally very small calculators was developed and sold from 1972. Trans Atlas took over NCE and Summit in 1974, by which time there was a glut of manufacturers in a maturing, low profit market and manufacture of Summit calculators ceased. Ed Price went on to form a new company, Price Research Associates, which made one characteristically tiny hand-held model. Click here to read the excellent article "Summit: a Man and the Idea" on the history of Summit calculators by Guy Ball in the Collecting Calculators section of this site.